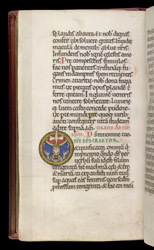 In the middle ages, there was a nunnery at Shaftesbury, and this psalter appears to have been made there or to have been modelled after a manuscript from Shaftesbury. Its calendar (used to coordinate prayers with saints' days and other feasts) and litany (a prayer appealing to saints for their help) mention saints who were especially venerated at Shaftesbury. The figures in its many pictures resemble a carving found at nearby Milborne St Andrew. Although its origins at Shaftesbury can not be shown beyond a doubt, it is certain that it was made for a female reader, probably an abbess. Recently a scholar suggested that it was made for Queen Adeliza, the widow of Henry I. The Shaftesbury Psalter was a personal prayerbook, used daily for devotions and spiritual contemplation. After the psalms it has a series of prayers, some of them decorated with small pictures in their first letters. This prayer is to the Holy Spirit, its first letter bearing a picture of a female figure--usually taken to be the Virgin Mary--with the dove descending and holding a golden disc over her head. It can be seen as having multiple references: the Incarnation of Jesus within Mary, the descent of the Holy Spirit at Pentecost and even a reference to the female reader's contemplation and worship of the third person of the Trinity, as the figure's identity is left ambiguous.